Serving as the national repository for arson and explosive related incident data. To Increase regional and national situation awareness by collecting, analyzing, and disseminating information and intelligence products to assist U.S. federal agents, investigators from state, local, tribal, and military departments, and international partners in preventing violent crime and acts of terrorism. These products use statistical and technical information, as well as analysis trends related to the criminal use of explosives and arson. 1976: ATF began collecting, storing, and analyzing records on arson and explosives related incidents. 2004: The Attorney General mandated that all Department of Justice arson and explosive related incidents be consolidated in a single database, known as BATS. 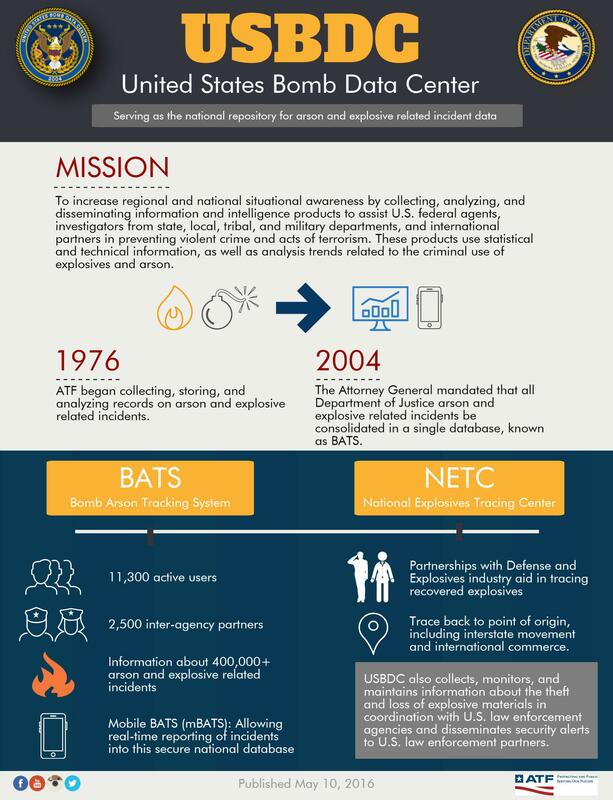 USBDC also collects, monitors, and maintains information about the theft and loss of explosive materials in coordination with U.S. law enforcement agencies and disseminates security alerts to U.S. law enforcement partners.